2,625 Piece Rack of Passenger Car Master Assortments Wheel Weights BOWES WW CWW075. The CWW074 & CWW075 lead wheel weight master assortments are comprehensive weight kits that include all seven standard weight types needed for today’s passenger car market. 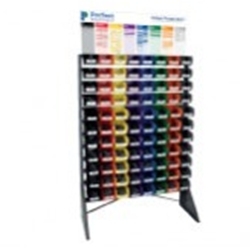 Both come complete with a floor-standing rack with ample storage space for the Perfect Equipment invented, color-coded bins to make weight identification quick and easy. Additional installation tools and educational information are also included. Actual kits may vary from inclusion list and photo shown.